You are able to choose companion who put healing spell on you like a cleric from your favorite followers. Your healer will cast healing spell on the person whom you selected not only your companions. Also you can set that any enemy might become the enemy side healer. Version 1.4 mainly fixed some problems that are not fatal. Modified the behavior of healer to reduce the unnatural movements than the old version. Modify: Healing logic and part of constant monitoring function. Modify: Spellcasting scene. Courage, Rally, Armor spells. Modify: Spellcasting voice folder with invisibility spell and muffle spell is prepared. Fix: Healer sometimes do not cast courage spell. Fix: Some problems that are not fatal. Modify: Healing logic and part of constant monitoring function. Especially, behavior of healer in Soul Cairn. Add: Defender. Prefer attack enemies that has attacking healer or illusionist or player(selection by dialogue). Modify: Healing logic and part of constant monitoring function. Fluctuation of health value by Ring of Namira, Blessing of Arkay. Fix: Missing textures for "target selection spell". Fix: MCM item:"Cast to emeny". Modify: Healing logic. Especially low level player state of vampiric disease. Fix: Problem that are automatically dismissed when game load (for non teammate healer). Add: Dialogue type "Neutral Good" by dragomike. Player can change dialogue type on MCM. You are able to choose companion who put healing spell on you like a cleric from your favorite followers. Your healer will cast healing spell on the person whom you selected not only your companions. Also you can set that any enemy might become the enemy side healer. 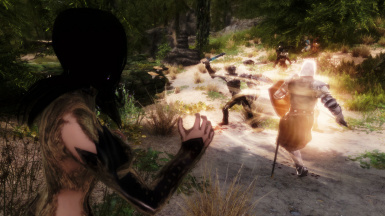 This mod enables a healing to any npc whom you selected from your favorite companion who has not special behavior in battle. 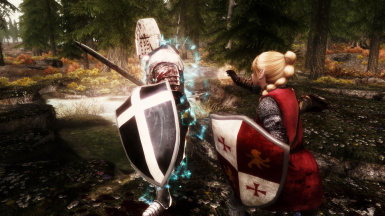 The purpose of this mod is to make the journey with favorite follower who will assist player from time to time using healing and light magic like the cleric class. This mod is a part of my faction mod. I thought that I want more assistant for adventure. So I had duplicate a part of healer function as new mod. 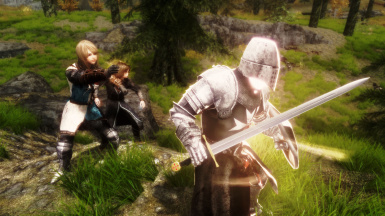 Enjoy an adventure of the land of skyrim with your favorite companions. Healer will try to cast healing spell to player, your follower and selected npcs. Healer will try to cast courage to player. (Dialogue and MCM configuration). 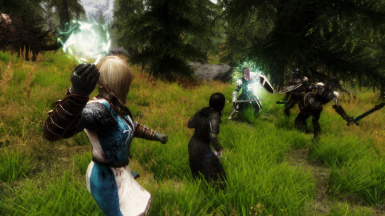 Healer will try to cast protection spells (Oakflesh, Ironflesh, Stoneflesh, Ebonyflesh) to player, your follower and selected npcs. (MCM configuration). If you can manage spellcasting voice file, put them to prepared folder and enable MCM item:"Chant voice type". The folder location is data - sound - fx - mx2bwh - chant - type01 or type 02 or type03 or type04 or type05. (version 1.3) Illusionist will cast mainly illusion spells(Calm, Fear, Fury) to enemies. (version 1.3) Defender will prefer attack enemies that has attacking healer or illusionist or player(selection by dialogue). The enemy attacked might change target to the defender. Defender will assist the healer, but the role is NOT TANK. Before install v1.4, Enable MCM item:"Uninstall" and close MCM menu. Enable MCM item:"Enable healer system" and close MCM. Talk to your follower who you want to request healing work again. If you do not feel that there are any problem on old version, it is not necessarily to update to v1.4. I highly recommend the following tools for install. NMM or MO or Wrye Bash. Enter MCM menu and enable Item:Enable healer system. Talk to your follower who you want to request healing work. Adjustment is available with dialogue and MCM. Enter MCM menu and enable item:Uninstall. Close MCM menu and wait few seconds. Save and quit game. Deactive MX2BeWithHealer.esp. To expect more response, you are able to modify. MCM item:"Combat update time" value change to lower. 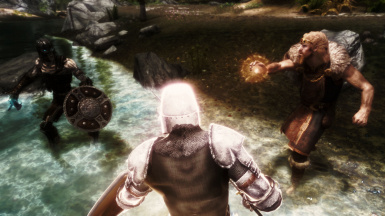 Because there are a number of skyrim environment by players, the default setting is not high. When mod environment is heavy load and value of "Combat Update Time" is minimum, remember that there is a possibility that healer is no longer work right. If healing target is player only and if you think that is not necessary to cast to enemy, healer action can change to ai package. Enable MCM item:"Allow package driven". Although it is not constant monitoring with script, healer can cast healing, courage, magelight, protection, cure paralysis to player. There are 3 method of target selection of the healer. "Use target list" or "Auto finding" or "Vanilla follower only". To change this method, need to re-request as healer with dialogue. Use target list - Default setting. Need to add npcs that you want to recovery. Even if player is not listed, the player is included. This was default setting as version 1.0, 1.1, 1.2. Auto finding - NPC that have the following flag will selected. Follower or PlayerTeammate. Vanilla follower - Vanilla follower system only. Selected healing target system require that the following MCM item state is enable. MCM Item:"Alternate heal target" list. When player equip modify spell - "Be With Healer modify spell (MX2)", healer will grow orange and healing target grow purple effect. Talk to healer and select "Check your recovery target." equip select spell - "Be With Healer modify spell (MX2)"
cast the spell to healer. cast the spell to npc that you want to add to healing target list. cast the spell to npc that you want to remove from healing target list. Talk to healer and select "Special recovery target is not exist now." cast the spell to healer or npc. 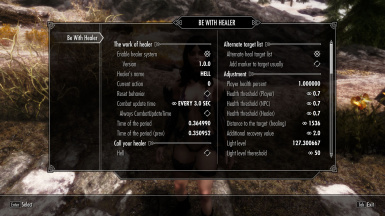 This function is a possibility that the enemies like bandits, forsworn, necromancer, warlock and vampire has a healer with a low probability. This feature add the healer ability temporary to enemy that already exist. It is recommended that use any enemy increase mod. When use this feature, enable mcm item "Enable Enemy Healer". It is possible to disable this function at any time. This option allows you to give a recovery potion to your teammate and non hostile people by activating. It is available when target health is low or in combat condition. In role play of a pure warrior build, you can go near the damaged healer and recover with medicine, not magic. For use with EFF, this option works only on Dialogue menu mode. Spellcasting will be interrupted when healer is attacked. Even if healer does not have healother spell and courage spell, healer can cast these spells. 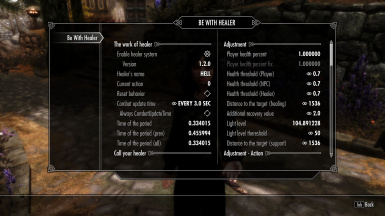 Healer who amount of magicka is 0 can't cast a healing spell. Enable mcm item:"Additional magicka". To receive the recovery magic, targets including player must be within a distance set by MCM. Even if player is not listed when player check a target list, the player is included. When player is sneaking during 5 second, magelight that healer put on will disappear. When healing target dies, target will be removed from target list. 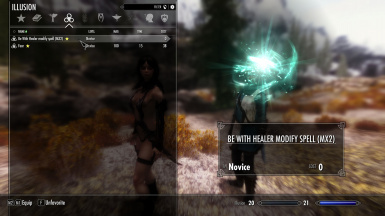 If healer cast healing spell to dead npc repeatedly, try to use modify spell. Select "remove" or "remove dead from list". The behavior of the healer is based also on his(her) own combat style. (Option) Player can ask healer role to your follower. Also it is possible to ask healer role to some people who is not hostile by MCM configuration. For example, Adrianne and Balgruuf. Heimskr cannot become your healer. He has strong will. When MCM item:Force follow is enable, It it possible that any quest that healer belongs to may not continue properly. (Option) Healer's AI value and Combat Style can be changed on MCM. By modified these values, it changes the behavior of the healer in combat. 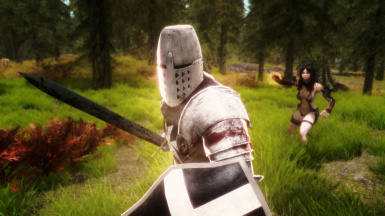 Do not melee attack or prefer melee attack and frequently shield bash or etc. It need to enable MCM item:Extended Info. Also please refer to AI Data Tab (Creation Kit) and Combat Style (Creation Kit). "Close Range Dueling Circle Mult" and "Close Range Fall back Mult" belongs at "Dueling" on Combat Style Tab "Close Range". Also "Close Range Flank Distance" and "Close Range Flank Stalk Time" belongs at "Flanking" on Combat Style Tab "Close Range". 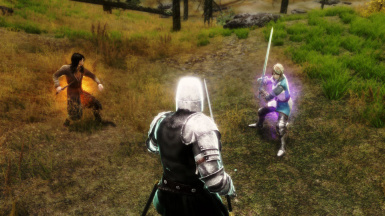 Dueling or Flanking, either one is available and it is determined by npc own combat style data. It cannot change from mcm. It can check by Creation kit and TES5Edit. 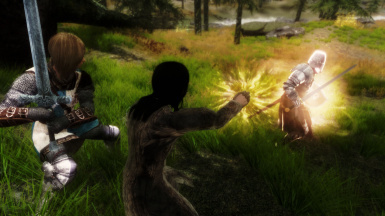 If you want to use "Flanking", but current combat style is "Dueling", you should change it on Creation Kit or TES5Elit, or find other follower who has "Flanking" in combat style. Remember that when player ask healer role to npc, AI values and some combat style values is memorized. when healer role is finished, memorized values will be recovered. When healing target is player only, it is possible to change healing method. Player can chosse ai package driven or constant monitoring with OnUpdate function. MCM item:"Allow package driven" mean change healing function by the number of targets. The default setting is enabled. When healing target is player only and MCM item:"Allow package driven" is enabled, healer would not cast fear spell. Defender is NOT TANK. Defender will not provoke enemies actively. 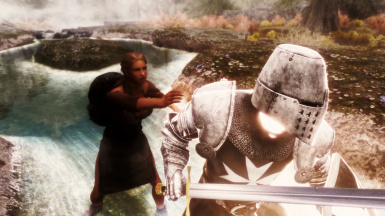 If aggresive provoke is needed, it is better to use other mods. And it is not recommended that assign this function to teammate who has already similar function by other mod. For the followers that has their own behavior, there is a possibility that it does not work as expected. I ordinarily use a not complex follower extension mod. I not use EFF and AFT. I tried to use EFF with my mod. It seem to work fine. Also AFT seem to work fine. Version 1.4 mainly fixes some problems that are not fatal. (for advanced player) By using spell and MCM, player can modify healer AI value(aggression, Confidence, assistance, morality) and some Combat Style value. It need to enable MCM item:Extended Info. About AI and Combat Style, please refer to AI Data Tab (Creation Kit) and Combat Style (Creation Kit). Thanks to dragomike for lore friendly dialogue.